In September 1836, a group of intellectuals, primarily disaffected Unitarian ministers from Boston and Concord, met to discuss theological and philosophical issues, including church reform. Originally called "Hedge's Club" or "The Hedge Club" (or just "The Club"), it was named for Frederick Henry Hedge, a graduate of Harvard Divinity School and one of the Unitarian ministers in this circle; in the 1840s the group changed its name to The Transcendental Club. This group introduced The Dial literary magazine in July 1840 as a way to publicize their views, and its first editor was the club member and formidable intellectual, Margaret Fuller. She was not the only female participant of this club which included such leading intellectuals as Ralph Waldo Emerson and Bronson Alcott. Elizabeth Peabody, sister of Sophia Peabody, and Lidian Emerson, Emerson's wife, were among the several women members. Sophia herself, secretly engaged but not yet married at this time, also attended some meetings of the Transcendental Club with Hawthorne. One member of the club, Harvard graduate George Ripley, announced to his congregation at the Purchase Street Church in south Boston on March 28, 1841, his plans to resign from his position and indeed to leave the ministry altogether. For two summers in 1839 and 1840, he and his wife, Sophia, had spent July and August in West Roxbury staying with friends on their dairy farm eight miles from Boston. 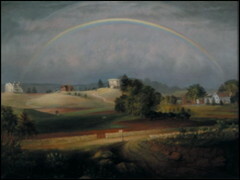 Sterling F. Delano suggests that during a summer of reading and reflection at the Ellis Farm in West Roxbury in 1840, Ripley may have read Albert Brisbane's new book, Social Destiny of Man; or Association and Reorganization of Industry, which set forth the utopian ideas of French philosopher Charles Fourier (19). Also during that summer, Ripley and his friend, Theodore Parker, another Unitarian minister, attended the "Groton Convention," a meeting of those interested in religious reform. Among those in attendance was Bronson Alcott who was inspired by this meeting to start the ultimately short-lived utopian community of Fruitlands in Harvard, MA in 1843. For Ripley, too, this meeting "proved to be a defining moment" (Delano 22). By September of 1840, Ripley was talking to friends about starting a communal society aimed at creating harmony of intellectual pursuits and physical labor. He eventually settled on the 170 acres of meadows and woods at the Ellis Farm in West Roxbury as the most desirable location. Ripley attempted to interest Emerson, who was in a position to help finance the venture, and met with him, as well as Margaret Fuller and Bronson Alcott, in October and followed up with a letter to Emerson in November. Emerson seems to have been genuinely conflicted about this decision, but ultimately he demurred, sending a letter to Ripley on December 15 explaining his decision. Sterling F. Delano explains that Ripley's overture required Emeroson "to confront the problem of society versus solitude" (29). Although Emerson did not provide the financial support that Ripley had hoped for, Ripley forged ahead, and at the end of March, 1841, he moved to the farm, followed soon after by his wife. He created The Association, a company in which members of this new community, called the Brook Farm Institute of Agriculture and Education, would buy shares at $500 each. Those members who worked on the farm would receive free room and board and could send one of their children to the school on the farm. One aspect of this community which distinguished it from communities such as the Shakers or Hopedale Community, whose members were required to take a pledge of Christian religious faith, was that Brook Farm did not require its members to adhere to any religious belief. While Emerson had declined the invitation to live at Brook Farm, Hawthorne accepted. Hawthorne had left his position at the Boston Custom House on January 1, 1841, after a Whig, not a Democrat, was elected president. Although Hawthorne was in search of gainful employment, it seems hard to understand why Hawthorne, a man who was never much of a joiner, never was a member of any church, who cherished his solitude, and who was skeptical of movements to reform society, would have been enticed to join Brook Farm. Brenda Wineapple, however, finds Hawthorne's participation in Brook Farm not so surprising. She cites Margaret Fuller's remark that "'solitary characters tend to outwardness,--to association,--while the social and sympathetic ones emphasize the value of solitude, --of concentration,--so that we hear from each the word which, from his structure, we least expect'" (qtd. in Wineapple 147). Also, Wineapple points out, "In need of a home, an income, and a place to write, Hawthorne gladly gambled on Ripley's arcadia. The union of thinker and worker was irresistible to a man whose conscience still carped about idleness and still considered writing a frivolous pastime, no matter how much he wanted to do it" (147). At the time Ripley was organizing Brook Farm, Hawthorne was living at 54 Pinckney St. on Beacon Hill in Boston with George Hillard, an attorney and friend of the Peabody sisters, and his wife. He moved there from the boarding house on Somerset Place where he had settled when he first began working as measurer at the Boston Custom House on Jan. 11, 1839. He worked hard taking inventory of ships coming into Boston harbor, but it was not the days of hard work, but rather the tedium of the days when there were no ships arriving that were the most difficult. Still, these were the early days of his courtship of Sophia, and his letters addressed to "Mine own Dove" reveal that she was ever on his mind. It was at this time that Sophia painted two works that she sent to Hawthorne for his new quarters, both of which are today in the collection of the Peabody Museum of Salem, MA. One, Isola San Giovannii (1839-40), includes two figures, a man and woman standing on a bridge, which Sophia may have meant to represent the two of them. Hawthorne, it seems clear from his letters which are filled with confessions of his ardent love, was entirely besotted with Sophia, and this, perhaps even more than his resignation of his job at the Boston Custom House, may explain why Hawthorne decided to join Brook Farm at this time. He purchased two shares, one for him and one for Sophia, though he did not request that Sophia join him at the outset. He did, however, have high hopes that this community would be an idyllic setting for the start of his life with Sophia after their marriage. Hawthorne, who was among the early group of about fifty members of Ripley's utopian community, arrived at Brook Farm by stage from Boston in a snowstorm on April 12, 1841. It is also in a spring snowstorm that Coverdale arrives at the Blithedale community in The Blithedale Romance, the novel that, despite Hawthorne's protestations to the contrary, contains many references to Hawthorne's experiences at Brook Farm. The novel is not meant as a fictionalized version of Brook Farm, however; for one thing, it examines a range of social movements such as feminism, spiritualism, and prison reform, but Hawthorne does incorporate characters, settings, and experiences from his days at Brook Farm. Moreover, he includes references to other events that occurred after his days at Brook Farm, including the drowning of Martha Hunt, a young woman whose body Hawthorne helped find in the Concord River in July 1845 when he and Sophia were married and living at the Old Manse. Residents of Brook Farm lived in communal houses, one of which was the farmhouse, also known as the Hive. Downstairs in the Hive were the dining and sitting rooms, used as the common rooms by all the residents of this building. Hawthorne had the front right room which he believed was the "'best chamber in the house'" (qtd. in Delano 50). From this location, Delano points out, Hawthorne "could combine society and solitude, browsing through the volumes of Ripley's library [which was on shelves just outside Hawthorne's room] while he quietly observed" like the protagonist Miles Coverdale in Hawthorne's thinly disguised satiric novel in 1852 about communal life, The Blithedale Romance, "the comings and goings of his housemates" (50). Hawthorne spent his days laboring in the fields with the other men while the women tended to the domestic duties, an arrangement that soon changed to allow a more equitable division of labor. At first, Hawthorne expresses to Sophia his satisfaction with his long days of chopping hay and wood, and after Sophia visits him in late May, she tells Hawthorne in a letter, "'Most joyfully could I dwell there for its own beauty's sake'" (qtd. in Delano 52). By June, however, Hawthorne's letters to Sophia indicate that the glow of life at Brook Farm is dimming as the long work days leave Hawthorne feeling as uninspired to write as did his days in the Boston Custom House. Indeed, he seems less and less inclined to see Brook Farm as the ideal place to begin married life with Sophia. Sterling Delano points out that Hawthorne "was especially disheartened by the mounds of manure --which Ripley kept cheerfully referring to as the 'gold mine' that needed to be continuously spread around the farm" (56). Delano notes that in a letter from Hawthorne to his fiancée at the beginning of June, "he angrily referred to the manure pile as 'that abominable gold mine!'" (56). Though upon his return to the farm later in the month he became a boarder rather than a laboring member of the Brook Farm community, he still found the atmosphere not conducive to his creative impulses, although he did manage to enjoy walks during crisp fall days during which he discovered wild grapes. Even after being made a trustee of the Association of Brook Farm, however, he was unwilling to commit himself to staying through the winter. In Hawthorne's letters to Sophia indicating his growing disenchantment with Brook Farm in the early fall of 1841, he also expresses concern about Sophia, specifically her curiosity about mesmerism, the new rage. Elizabeth Peabody, Sophia's sister, believed that a mesmerist offered a possible source of a cure for the headaches which had plagued Sophia for so long, but Hawthorne beseeches his fiancée, " Take no part, I beseech you, in these magnetic miracles. I am unwilling that a power should be exercised on you of which we know neither the origin nor consequence, and the phenomena of which seem rather calculated to bewilder us than to teach us any truths about the present or future state of being." In Blithedale, Hawthorne explores the power of the mesmerist which, Hawthorne believed, had the potential to violate the sanctity of the individual soul. Hawthorne makes other references in Blithedale to his experiences and thoughts while at Brook Farm. For example, Priscilla in Blithedale sews purses, and while at Brook Farm Hawthorne met a new member, a young girl from Boston who was a seamstress. She made a distinct impression on him, and he writes about her in his letters. Hawthorne also includes scenes of a picnic and masquerade party in the novel which are based on such actual events at Brook Farm, specifically a birthday picnic for six-year old Frank Dana. As part of the festivities, Margaret Fuller, Ralph Waldo Emerson, and others donned costumes and performed a frenzied dance. In November Hawthorne departed from Brook Farm for good. He left, Wineapple argues, "for the same reason he went there. He misjudged both himself and the situation. He realized the farm could never support him and Sophia. He couldn't write there. Nor could he tolerate the idea of a cold winter far from Sophia or a future of mind-numbing toil" (154). He had written in his notebook on September 22, when he returned to Brook Farm after a visit to Salem, " I have not the sense of perfect seclusion which has always been essential to my power of producing anything"(AN). At this juncture, Hawthorne divided his time between Boston and Salem. He attempted to recover the money he had invested in Ripley's community but was unsuccessful. Thus Brook Farm did not turn out to be the place where Hawthorne would take his new bride. Instead, after their wedding in the Peabody house on West St. in Boston on July 9, 1842, the newlyweds travelled by carriage to Concord where they moved into the Old Manse, a roomy house on the Concord River very near the Old North Bridge, which Hawthorne had rented from Samuel Ripley, a minster from Waltham who had inherited the property from his father, Ezra, in 1841. Not surprisingly, this lovely house with its garden planted for the couple by Henry David Thoreau, not the communal dormitories of Brook Farm, provided the idyllic setting which Hawthorne had sought to begin life together with the woman he so adored. Delano, Sterling F. Brook Farm: The Dark Side of Utopia. Cambridge: Harvard UP, 2004. Wineapple, Brenda. Hawthorne: A Life. NY: Knopf, 2003.